When it comes to product shipments, it helps to think outside the pallet box. There are dozens of unique pallet designs built to accommodate every imaginable shipping and storage requirement. While most manufacturers tend to stick with the standard U.S. 48×40” pallets, knowing the full gamut of pallet options makes it easier to find the type that best suits your needs in the long term. Not sure what’s out there? 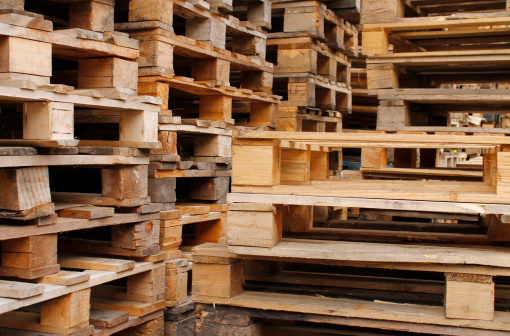 The following is a handy lexicon to brief you on the most common pallets types on the market. And if the choices seem bewildering, try consulting a pallet professional — that way, you’re guaranteed to be purchasing the most cost – and energy – efficient pallet for your needs. Box/bin pallet – A pallet base with four firm sidewalls and an optional cover. They’re less expensive than a fully sealed container and easier to fill and access, though also much heavier than standard pallets. Block pallet – This pallet features blocks between the pallet decks for better entry on all four sides. Typically, they tend to cost more due to increased board footage required to manufacture. Captive pallet – They’re typically more durable, and meant to be used within a closed-loop system or at a single internal facility. Think of them as the opposite of exchange pallets, which are built to be shipped and, subsequently, sold away. Disposable/expendable pallet – Also known as “one-way pallets” or “shipping pallets,” disposables are inexpensive and ideal for open-loop systems where shippers don’t expect their pallets returned. These pallets are designed to meet unit load requirements and aren’t likely to be re-used after shipment. Double-face pallet – A pallet with both top and bottom decks. They’re easy to work with, and ideal for distributing heavy loads when tiered in stacks. Double-wing pallet – Similar to a double-face pallet, the top and bottom deck boards in double-wings extend beyond the edges of the stringers. Euro pallet – These block-style pallets, 1,200x800mm, are standardized by the European Pallet Association. Look for the EPA logo marking any official Euro pallet. Flush pallet – Contrary to double-wing pallets, flush pallets feature deck boards flush against the pallet sides, whether they’re stringers, stringer-boards, or blocks. Four-way block pallet – A pallet with openings on all four sides, for situations when hand-pallet jacks are needed from every angle. This makes them easier to maneuver. Panel deck pallet – A pallet with an added top deck for composite or structural security. They’re more expensive than pallets using standard decking due to the cost of the paneling, i.e plywood. Reversible pallet – A pallet palindrome: this one has identical top and bottom decks. Two-way reversible pallets are known for their strength and durability, however they’re harder to repair than your typical pallets. Shipping pallet – See “disposable/expendable pallets,” above: shipping pallets are inexpensive and ideal for open-loop systems where shippers don’t expect their pallets returned. Single-wing pallet – A hybrid between double-wing pallets and flush pallets, the top deckboards on single-wings extend beyond the sides (stringer-boards or stringers), while the bottom deckboards remain flush. Slave pallet – Rack-storage facilities and production lines use slaves for basic support bases when palletizing loads. Solid deck pallet – A pallet with no spaces between deck boards, creating a literal “solid deck.” Stronger and heavier than regular pallets, and better for maintaining heavy loads. Stevedore pallet – Designed specifically for seaport shipping docks, stevedore pallets are often double-winged and unusually strong. Take-it-or-leave-it pallet – Fixed with cleats on the top deckboards, take-it-or-leave-it pallets are designed so that forklifts can pass beneath the unit load and remove it safely. Two-way entry pallet – The solid stringers on two-ways are not notched, allowing easy entry only from the ends. This keeps the sides secure, though it demands a stricter approach to handling. Warehouse pallet – Doubled-faced and intended for multiple uses, these are built for general warehouse use. Good to keep repairing and using again, as they’re considered something of a catch-all pallet. Keep this reference list handy — if you ever switch up your product or shipment methods, you should reconsider your pallet type, and understanding the differences beforehand can save you time in the future.